It’s a must to take cooking – and dining – outdoors once the weather warms up. But that should by no means restrict how we flavour our dishes, believes Martine Nouet, who shares ideas on how to get creative with whisky and food this summer. Summer triggers in us the urge to spend as much time as possible in the open air. It is the season for picnics, barbecues in the garden, buffet parties, drinks on the terrace at bars and restaurants or drams on the shore. In a word, we want to live outside. Well, the dismal weather which affects most of Europe (at least the Northern regions) may put a curb on this desire but – who knows? – summer may finally be happening. The two best descriptors for a (normal) summer for me are: intensity and colour. Summer is the season of the extreme. Bright colours are even bolder; fruit and vegetables are colourful, ripe and juicy. We go for natural and unsophisticated – but tasty – food. The sunny days concentrate textures and flavours, as water evaporates under the heat. The air is salty. If we breathe spring, we taste summer. Midday is the most appropriate time for the season as the sun is at its highest. Described as the ‘holiday season’, summer offers a break in daily routines. We take the time to relax, to meet old friends and to make new ones. Definitely a communicative and conversational season, summer calls for whiskies of the same mood. Intensity and depth are the characteristics of summery whiskies. Full-bodied, they express a warm and cheerful character. Some display fruity and honeyed aromas, while others show a marine style. Spices – particularly pepper and a salty feel – outline the aromatic profile. If we look at whiskies and food in colour, we tend to go for bright, intense yellow, warm red or deep green. With meat such as beef, a fruity Speyside with a Sherry finish like Aberlour 12 Year Old Double Cask Matured or The Balvenie Double Wood make the perfect accompaniment. With lamb, a spicy profile like Longmorn 16 Year Old would make a good match. For a chicken grilled with herbs and lemon, go for Glenmorangie Original or a vintage Balblair. With seafood, I prefer a young peated malt matured in Bourbon casks: Caol Ila Moch and scallops, Big Peat and mussels, Caol Ila 12 Year Old and crab or lobster. Unpeated but still marine-style whiskies can make a good pairing too, such as Bruichladdich or Oban. River fish will get on with fruity and smooth malts such as The Glenlivet or Glenfiddich. This style of single malt will also work well with delicate sea fish. But sardines or mackerels need a strong character like Laphroaig or Talisker to match. As the open air (when possible) is the decor of our summer meals, barbecues will be your favourite kitchen utensil. It is easy to buy disposable versions, which can be carried and used anywhere – provided you respect simple safety rules, of course. Now, you will have to be more imaginative than grilling a few sausages or burgers. You can do better, believe me. You will need some basic ingredients and tools to produce creative barbecues. Besides the traditional utensils provided with a barbecue, don't forget foil paper and a spray. The former will be used to wrap fragile produce such as vegetables, fruit or fish. The latter, filled with whisky – maybe have two, one with a Speyside malt and the other with a peated Islay malt – will give the final touch to your grilled lamb chops or grilled lobster. Now if you are on a beach, gather wet seaweed which can be used to steam scallops or mussels. Let’s have a look at the seasoning. Olive oil is precious; why not prepare aromatised versions with basil or other herbs, chilli, lemon – but of course without garlic! A little box with a few spices will be useful too: salt and pepper, paprika, cumin, ginger and cinnamon. What can you grill? Virtually everything. When it comes to the desired doneness, though, tastes differ. In France, we tend to like our meat rare, a concept totally misunderstood in Britain. For this reason, I would recommend grilling big pieces of meat like a leg of lamb or a roast which will allow different stages of cooking to please everyone. Seafood is delicious on the grill: scallops and shells on a bed of seaweed or wrapped in foil, and the same goes for lobster. A big fish stuffed with herbs and fennel, then brushed with whisky and olive oil will cook en papillottes (in parcels). 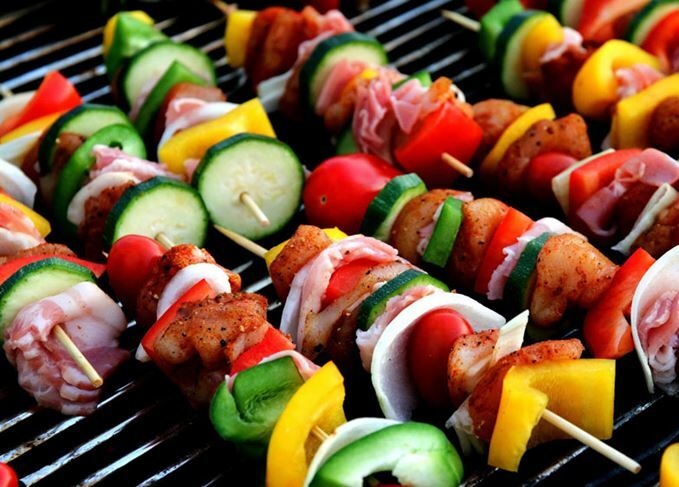 Vegetables to accompany the meat or fish can be cooked or ‘finished’ on the barbecue. Peppers and mushrooms may be cooked on a skewer and tomatoes wrapped in foil. Potatoes can be pre-cooked and wrapped in foil. Prepare a tray of seasoning for your baked potatoes: flavoured butter with herbs or citrus, cottage cheese or cream with crushed hazelnuts or black olives, and even barbecue sauce. Make your own barbecue sauce with home-made tomato purée, vinegar, molasses, onions, spices and add fruit depending on what you cook – apricot with lamb, apple or plum with pork, or lime with chicken. For grilled fish, opt for simplicity: an excellent olive oil with a dash of lemon or lime juice, or even a herb emulsion. You need one or more salads to accompany your main dish. Again, use your imagination: a Moroccan salad with lamb (grated carrots, orange juice, cumin and raisins soaked in whisky); finely cut fennel with coriander and orange to serve with fish; French beans and walnuts with beef; or a pasta salad with truffle oil and mixed vegetables. Why not finish with a barbecued sweet? Toasted brioche with a fruit salad and ice cream. Grilled peaches sprinkled with basil and served with vanilla custard. Fruit on a skewer rolled in shortbread crumbs, or served with a fruit coulis and a dash of whisky, of course. The possibilities are endless. This is the second instalment in our summer whisky series. See Dave Broom's selection of summer Scotch sippers, and keep your eyes peeled tomorrow for cocktail inspiration from Ryan Chetiyawardana. Dave Broom has hand-picked a selection of Scotch whiskies to perfectly match the warmer weather. Ballindalloch’s visitor host explains how ‘single estate’ life compares to the might of Glenfiddich.